Statblocks done right? You decide! 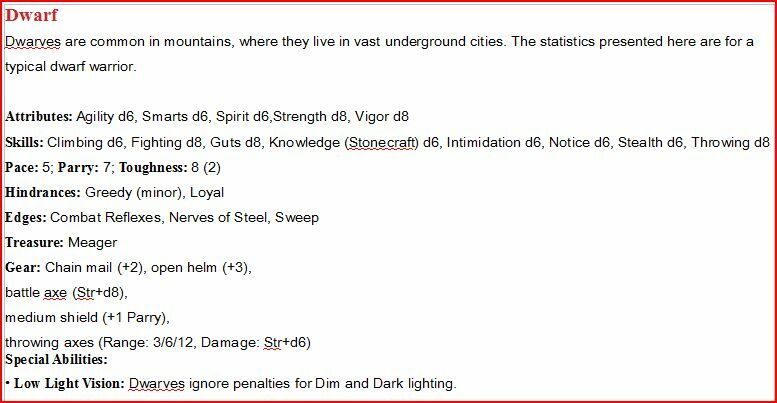 The DnD Statblock for 4E. Most of us are familiar with it in some form or other. It has not changed much right? The OpenQuest Statblock. It Contains lots of numbers, but that is normal for a D100 system. Still, that is one A4 page of Information! 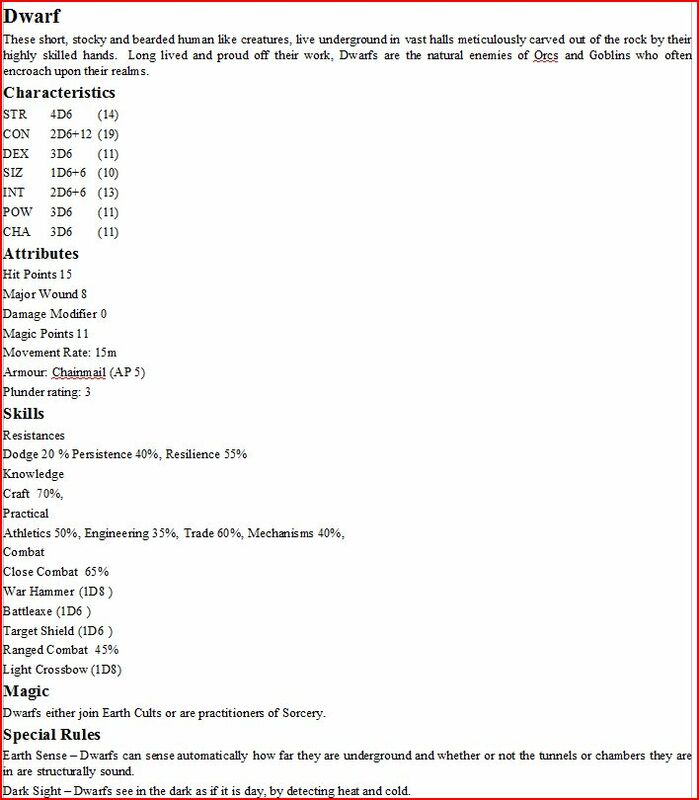 The Savage Worlds Statblock. Better because smaller? But still just a list of basic Information. At first glance there is alot more information on there and it seems harder to read. Personally I find it is invaluably better then our ususal Statblock for several reasons. It not only has stats but also vital role playing information. It has an entry for several senses. The entries are colour coded for offensive/Defensive Edges and Items. I see immediately where to look if he attacks or is attacked. The colours are so smartly picked that the effect remains even in BW! It has a small description of all the edges/hindrances a character has, so no digging through books. It is placed where I need it in the adventure. For me as a more “Winging it” and “Go with the flow” GM this is really a great help, especially in reminding me of important rules I may otherwise forget. 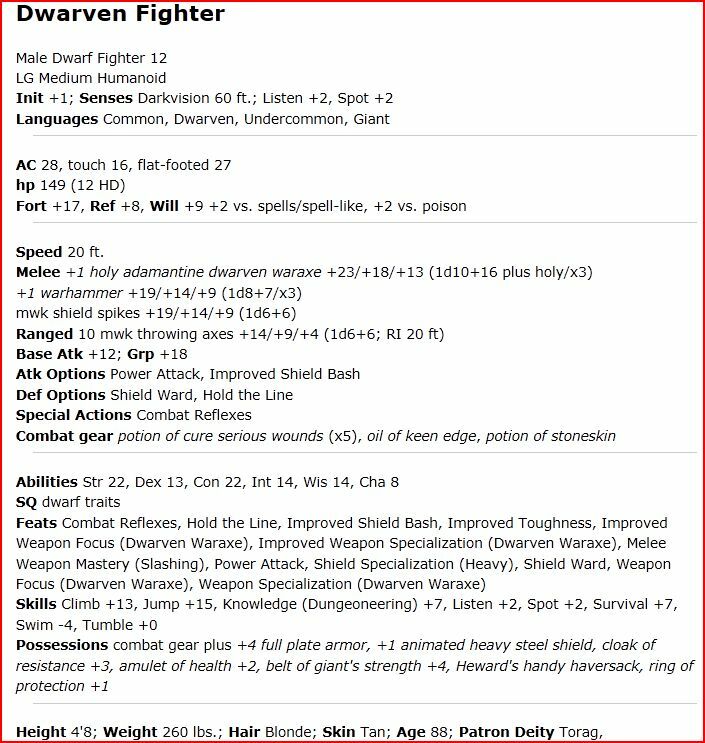 Is this still a Statblock or a really condensed NPC entry? From now on I wish I would only get blocks like this in published adventures. I have to admit as preparation it could be too time consuming to fill out completely, but I will try to use it a s a template to at least approach some of the level of detail. When the Statblock is presented like this it not only saves me a lot of time but actually enhances my game. Sadly I was not able to playtest this as much as I wanted, so I may revisit this topic in the future. For more Information regarding the new Statblock check here and here. Thanks for the compliments! We worked pretty hard on the layout, and the stat blocks specifically. Jeff spent many hours toiling over color and layout design. We’re pretty proud of the results. We’re looking forward to the review, could you shoot me an e-mail when you get it up? I’m excited to read it, good or bad. Thanks for the great response and commentary! Tell your friends!